Welcome to the age of behavioral addiction - an age in which half of the American population is addicted to at least one behavior. We obsess over our emails, Instagram likes, and Facebook feeds; we binge on TV episodes and YouTube videos; we work longer hours each year; and we spend an average of three hours each day using our smartphones. Half of us would rather suffer a broken bone than a broken phone, and millennial kids spend so much time in front of screens that they struggle to interact with real, live humans. 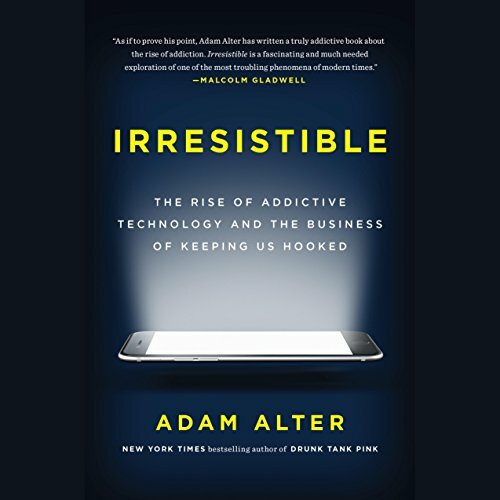 In this revolutionary book, Adam Alter, a professor of psychology and marketing at NYU, tracks the rise of behavioral addiction and explains why so many of today's products are irresistible. Though these miraculous products melt the miles that separate people across the globe, their extraordinary and sometimes damaging magnetism is no accident. The companies that design these products tweak them over time until they become almost impossible to resist. By reverse engineering behavioral addiction, Alter explains how we can harness addictive products for the good - to improve how we communicate with each other, spend and save our money, and set boundaries between work and play - and how we can mitigate their most damaging effects on our well-being and the health and happiness of our children. The author does an incredible job piecing together anecdotal evidence, clinical presentations and research to provide a convincingly disturbing analysis of the dangers parents (I am a father of 6) unwittingly expose their children to. A MUST READ for every parent of children under the age of 21! For that matter it is also a cautionary tale for adults since smart phones are ubiquitous in western society and most adults polled say that they "can't live without" one. Anyone with kids today should read this book. Analyze yourself your kids and your future. I didn't enjoy the narrator but the story was very interesting and sparked some conflict with my technology use. Adam Schafer her from mindpump media podcast has been raving about this book for months. I am so happy I took his advice and purchased the book. It completely lives up to all the shining accolades Adam gave it. Very interesting book that illuminates the dark side of technology. As I listened, I thought about how I use technology and some ways I should change my approach. Although I initially borrowed this audiobook from Scribd, I've since purchased it so I can listen again. Highly recommended. a must-read for all, but specifically for parents raising their children and the technology saturated culture. The book did a wonderful job balancing real life relatable stories 2 research highlighting the importance of attention to this topic. Adam does a nice job developing the different ways in which technology is created to be invasive in our lives. This book is excellent but the last couple of chapters seemed to be a bit tired and wander from the power of the first. There aren't easy answers and it seems like there was a bit of giving up at the end. I think this book combined with "The Tech Wise Family" by Andy Crouch would be a good launching point for both the problem and a solution. Because of this book I have a better understanding on why people are hooked to their phones, games, and so on. Highly would recommend this if you are trying to cut down screen time, or want to figure out all the parenting drama behind new tech and your kids. Das Buch bringt einige der Probleme der modernen Medien auf den Punkt. Ein tolles Buch für alle die nicht selbst in die Falle geraten wollen und auch ein gutes Buch für Eltern. Der Autor, ein Professor aus New York, befasst sich eingehend mit dem Thema, wie die modernen Medien des Internets zu global agierenden Spielautomaten herangewachsen sind, die unser Verhalten gezielt steuern und fast jeden Menschen, der sie nutzt, mehr oder weniger zu einem suchtgesteuerten User umgekrempelt haben. Schnell zeigen wir auf Kinder und Jugendliche, die in ihren Telefonen versinken und die Welt an sich vorbeiziehen lassen - sind jedoch auch als Erwachsene kaum weniger betroffen, eher nur anders. Das Buch kann ich jedem empfehlen, der dieses Thema spannend findet und verstehen will, wie es dazu kommen konnte.